It all began in 1905 in a small garage at the fringe of Munich. Franz Ritter founded his ritterwerk. Franz Ritter at first developed knife cleaning machines, which were of great importance at times when there were no stainless steel yet. With this device knife blades could be cleaned from rust. 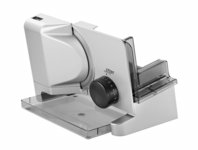 The knife cleaning machine by ritter was sold over 100.000 times until stainless steel was introduced to the market. The foundation for its success was laid almost 30 years later by building the first bread-slicing machines. Some of these formerly modern machines are still in use now, more than 70 years later. 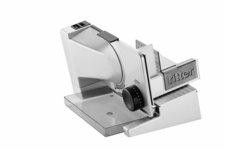 A pioneering tradition of slicing - from the long-familiar manual slicer to the electrical slicer and finally to the suspended and inclined construction. ritterwerk is truly a child of its time and carries the Bauhaus “gene”. 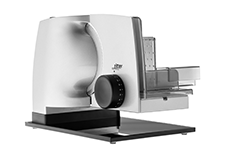 When we created our contura3 multislicer in 2008, it set new design standards in all aspects of functionality. It was followed in 2010 by the volcano, which is probably the most streamlined toaster in the world. The kettle fontana5 remains true to the simple, pure, clean and timeless Bauhaus style in both form and colour. Our cafena5 coffee machine completes the breakfast set which combines modern design and environmental friendliness: all three products have been awarded with the "Blue Angel" environmental label. The noble hand blender vertico7 even combines several advantages: the appliance makes do without an undesirable cord, is – due to its changeable battery – sustainable and, thanks to its lean design, fits perfectly into the product range by ritter. No matter whether built-in or table-top appliances, a ritter product does always help facilitate the everyday work in the kitchen. ritterwerk strives to optimise practical kitchen design in the spirit of the Bauhaus. ritters built-in solutions are innovative and pioneering, proven by the one and only built-in toaster. The medium-sized company, headed by Michael Schüller, develops, designs and produces exclusively in Germany. The company‘s philosophy ‚made in Germany‘ not only stands for its production site in Germany. It also incorporates high quality standards, appropriate materials as well as functional design and sustainability. Every year thousands of small appliances for the home and abroad market are manufactured and distributed at the company headquarters in Gröbenzell near Munich. “Made in Germany” will remain the productive key to this success.